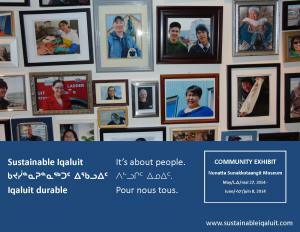 You are invited to our Community Exhibit: Sustainable Iqaluit – It’s about people. There’s a great story behind the Iqaluit Sustainability Plan. Come and celebrate the Plan – and the people behind it – starting this week! This exhibit is to celebrate cooperation in Iqaluit and publicly launch the Iqaluit Sustainable Community Plan with a community photography project. Our sustainability in Iqaluit is about people– it is people who take action, people who help the environment, people who support each other, and people who work for a better future. The exhibit shows that our sustainability is all about people.